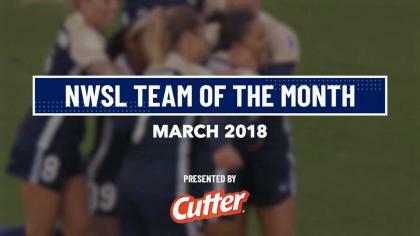 The North Carolina Courage won their 12th game of the season on Wednesday night, 4-1 over the Chicago Red Stars at Sahlen’s Stadium at WakeMed Soccer Park. The Courage are now 12-1-3 on the season, well in first place with 39 points — 16 points clear of their nearest competitor. They have outscored their opponents 35-14 this season. Since their first and only loss of the season to Utah Royals FC on June 16, they are 3-0 and have won those games by a margin of 11-2, all against teams in the top four playoff spots. The loss drops the Red Stars to 5-4-7 and 22 points. They still sit in the fourth playoff spot, one game ahead of Utah Royals FC who have played two less games than the Red Stars. Crystal Dunn opened the scoring for the Courage in the 20th minute with her seventh goal of the season. Jessica McDonald won the ball at midfield and passed to Dunn, running at the Red Stars backline with Debinha to her left and Lynn Williams to her right. With two defenders on her, Dunn took the shot herself and beat Red Stars goalkeeper Alyssa Naeher to make it 1-0. Dunn is now tied with Sinclair for the league-lead in scoring. The assist for McDonald was her fourth of the season, tied for second in the league. The goal from Dunn came just minutes after the the Red Stars had an early chance to take the lead, but were denied by Denise O’Sullivan in the 17th minute. On a Danielle Colaprico corner kick, Morgan Brian took a header shot on frame. O’Sullivan rose up to head it off the line and then won the follow-up header as well. The game went into halftime 1-0, but the Courage scored three times in the second half. In the 67th minute, Williams scored, getting on the end of a low cross into the box from defender Merritt Mathias, turning and sending a right-footed shot past Naeher to make it 2-0. It’s Williams’ fifth goal of the season, tied for fourth in the league. Then Debinha made it 3-0 in the 69th minute. Sam Mewis subbed in for Dunn in the 68th minute, and made an immediate impact with a long through ball that found Debinha running into the box in between two defenders. Naeher came off her line, but Debinha knocked it into the back of the net. In the 87th minute, Kristen Hamilton made it 4-0, finishing off a cross from Williams after the forward collected a bouncing ball in the box. It’s Williams’ fourth assist of the season. New Red Stars defender Brooke Elby was injured on the play after colliding with Naeher as they both attempted to make a play on the ball. Naeher inadvertently hit Elby in the face when she came off her line. It was Elby’s first start for the Red Stars, playing at right back. The Red Stars came out in a 4-4-2, packing the midfield vs. North Carolina’s usual 4-4-2. Danielle Colaprico, Morgan Brian, Julie Ertz and Vanessa DiBernardo underneath Rosie White and Sam Kerr at forward. It’s the first start of the year for Brian and Ertz’s return to midfield for the first time since the trades that sent away Sofia Huerta, Taylor Comeau and Sam Johnson. Brian played 68 minutes in her second game since rejoining the Red Stars and finished with 60 total touches, 45 pass attempts (80% accuracy), one shot on goal and one chance created. Yuki Nagasato converted a penalty kick in the game’s final moments to put the Red Stars on the scoreboard. Abby Dahlkemper was called for a foul on Ertz in the box to set up the penalty. Nagasato entered a substitute in the 60th minute. 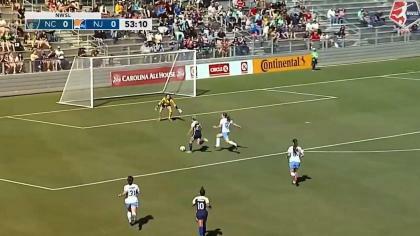 The Red Stars appeared to get a goal in the 77th minute when Kerr finished off a Colaprico cross, but Kerr was ruled offside on the play, though she appeared to be even with her defender. Kerr finished the game with six shots and one on target. She had a great chance to get the game’s first goal in the 16th minute, but her shot in the crossbar. The Courage’s newest addition, midfielder Heather O’Reilly, made her debut in the75th minute, subbing in for Debinha. She had a good cross into the box in the 85th minute, but it was headed clear by Red Stars midfielder Nikki Stanton. Courage midfielder McCall Zerboni went down in the 50th minute with what appeared to be a right ankle injury. After a collision with Debinha, Zerboni had to be looked at by the trainer and left the field for several minutes, but she did return and once again played the full 90 minutes. It was also the same leg that she took a hard knock to in the first half when Ertz was issued a yellow card for a hard foul on Zerboni. Mewis and Jaelene Hinkle returned to the field after missing last weekend’s win over Orlando due to injury. Hinkle played all 90 minutes and Mewis played the final 22 minutes of the match. Wednesday night’s game was originally scheduled to kickoff at 7 p.m. ET, but was delayed for an hour and 50 minutes because of lightning in the area. The Courage get the weekend off and will next be in action at home on July 11 vs. the Spirit. The Red Stars continue their stretch of three games on Saturday when they visit Sky Blue FC. Match ends, North Carolina Courage 4, Chicago Red Stars 1. Second Half ends, North Carolina Courage 4, Chicago Red Stars 1. Goal! North Carolina Courage 4, Chicago Red Stars 1. Yuki Nagasato (Chicago Red Stars) converts the penalty with a right footed shot to the bottom left corner. Penalty Chicago Red Stars. Yuki Nagasato draws a foul in the penalty area. Penalty conceded by Abby Dahlkemper (North Carolina Courage) after a foul in the penalty area. Delay in match Brooke Elby (Chicago Red Stars) because of an injury. Goal! North Carolina Courage 4, Chicago Red Stars 0. Kristen Hamilton (North Carolina Courage) header from very close range to the centre of the goal. Assisted by Lynn Williams. Attempt missed. Samantha Mewis (North Carolina Courage) right footed shot from outside the box misses to the left. Assisted by Denise O'Sullivan. Attempt missed. Kristen Hamilton (North Carolina Courage) right footed shot from the centre of the box misses to the left. Assisted by Lynn Williams with a cross. Offside, Chicago Red Stars. Danielle Colaprico tries a through ball, but Samantha Kerr is caught offside. Attempt missed. Samantha Kerr (Chicago Red Stars) header from the centre of the box misses to the right. Assisted by Danielle Colaprico following a set piece situation. Attempt saved. Lynn Williams (North Carolina Courage) header from the centre of the box is saved in the bottom left corner. Assisted by Denise O'Sullivan with a cross. Goal! North Carolina Courage 3, Chicago Red Stars 0. Debinha (North Carolina Courage) right footed shot from the centre of the box to the bottom right corner. Assisted by Samantha Mewis with a through ball. Substitution, North Carolina Courage. Samantha Mewis replaces Crystal Dunn. Substitution, Chicago Red Stars. Nikki Stanton replaces Morgan Brian. Goal! North Carolina Courage 2, Chicago Red Stars 0. Lynn Williams (North Carolina Courage) right footed shot from the centre of the box to the top right corner. Assisted by Merritt Mathias with a cross. Attempt missed. Vanessa Di Bernardo (Chicago Red Stars) right footed shot from outside the box is close, but misses the top right corner. Assisted by Danielle Colaprico. Attempt missed. Samantha Kerr (Chicago Red Stars) right footed shot from outside the box is close, but misses to the left. Assisted by Morgan Brian. Substitution, Chicago Red Stars. Yuki Nagasato replaces Rosie White. Corner, North Carolina Courage. Conceded by Sarah Gorden. Attempt blocked. Samantha Kerr (Chicago Red Stars) right footed shot from the centre of the box is blocked. Assisted by Brooke Elby with a cross. Attempt saved. Denise O'Sullivan (North Carolina Courage) right footed shot from outside the box is saved in the bottom right corner. Attempt missed. Abby Erceg (North Carolina Courage) header from the centre of the box misses to the right. Assisted by Debinha with a cross following a corner. Hand ball by Lynn Williams (North Carolina Courage). Attempt blocked. McCall Zerboni (North Carolina Courage) left footed shot from outside the box is blocked. Attempt missed. Lynn Williams (North Carolina Courage) header from the centre of the box misses to the right. Assisted by McCall Zerboni with a cross. Delay in match Rosie White (Chicago Red Stars) because of an injury. Goal! North Carolina Courage 1, Chicago Red Stars 0. Crystal Dunn (North Carolina Courage) left footed shot from outside the box to the bottom right corner. Assisted by Jessica McDonald. Attempt missed. Lynn Williams (North Carolina Courage) left footed shot from the centre of the box is just a bit too high. Assisted by Merritt Mathias with a cross. Brooke Elby (Chicago Red Stars) wins a free kick in the defensive half. Attempt blocked. Morgan Brian (Chicago Red Stars) header from the centre of the box is blocked. Assisted by Danielle Colaprico with a cross. Attempt blocked. Samantha Kerr (Chicago Red Stars) right footed shot from the right side of the box is blocked. Assisted by Rosie White with a through ball. Attempt missed. Morgan Brian (Chicago Red Stars) left footed shot from outside the box is high and wide to the left. Assisted by Samantha Kerr. Attempt blocked. Debinha (North Carolina Courage) right footed shot from outside the box is blocked. Assisted by Crystal Dunn. Attempt missed. Julie Ertz (Chicago Red Stars) left footed shot from outside the box is high and wide to the right. Attempt blocked. Vanessa Di Bernardo (Chicago Red Stars) left footed shot from outside the box is blocked. Assisted by Danielle Colaprico. Samantha Kerr (Chicago Red Stars) hits the bar with a right footed shot from the centre of the box. Assisted by Julie Ertz with a through ball. Foul by Brooke Elby (Chicago Red Stars). Attempt saved. Vanessa Di Bernardo (Chicago Red Stars) right footed shot from outside the box is saved in the top left corner. Assisted by Danielle Colaprico. Attempt blocked. Brooke Elby (Chicago Red Stars) right footed shot from outside the box is blocked. Attempt blocked. Danielle Colaprico (Chicago Red Stars) right footed shot from outside the box is blocked. Assisted by Samantha Kerr. Attempt saved. Jessica McDonald (North Carolina Courage) right footed shot from the centre of the box is saved in the centre of the goal. Assisted by Debinha with a through ball. Attempt missed. Debinha (North Carolina Courage) right footed shot from the left side of the six yard box is close, but misses to the left. Assisted by Jessica McDonald with a cross. Attempt saved. Samantha Kerr (Chicago Red Stars) right footed shot from outside the box is saved in the bottom left corner. Assisted by Julie Ertz.